The transition to assisted living is a traumatic event for the entire family. Nearly ninety percent of Baby Boomers are afraid that their parents will be sad when they have to move--and could be mistreated in this unfamiliar environment. Perhaps not surprisingly, these concerns are well-founded. 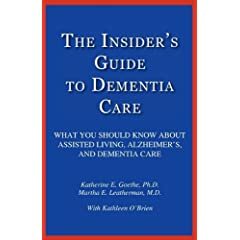 In their new book, The Insider's Guide to Dementia Care: What You Should Know About Assisted Living, Alzheimer's and Dementia Care, Katherine E. Goethe, PhD, a neuropsychologist, and Martha E. Leatherman, M.D. a geriatric psychiatrist, identify the emotional components of choosing long-term care and pinpoint the positives and negatives of available options. Perhaps most important, they expose the gap between the glowing marketing promises and the gritty reality of daily life in an assisted living facility. Doctors Goethe and Leatherman give families permission to doubt, to ask questions, and to complain. The Insider's Guide to Dementia Care is a must-read for everyone considering long-term care for their loved ones. NURSING HOME REVOLUTION: "GREEN" LIVING! The Green Houses face several obstacles, including regulatory issues. But some say they also face resistance from existing nursing homes, which are based on an economies-of-scale model--the larger the home, the cheaper it is to care for each individual resident. While some nursing home operators welcome the idea of Green Houses, others are reluctant to help pay for them, says Susan Reinhard, who heads the AARP’s Public Policy Institute. “You have owners who have their personal wealth invested in a model that was requested by society way back,” she says. A significant challenge is convincing the nursing home operators that Green Houses aren’t too expensive. “The biggest criticism I hear is, ‘How do you make it work financially?’” adds Larry Minnix, CEO of the American Association of Homes and Services for the Aging (www.aahsa.org), which represents not-for-profit nursing homes as well as assisted living and retirement communities. The foundation says it’s studying the financial sustainability, but early indications show that it’s financially doable. Pictured above is the Tabitha Green House Project in Lincoln, Nebraska, a new and attractive choice for elders and their families. In May 2006, Tabitha opened the nation’s second Green House Project. The Green House transforms the way care is delivered, departing from the traditional nursing home model by bringing long-term care into a home setting. Nine people live in the first Green House, each with their own private room and bath.